Bingo Night, Kids Heart Challenge, Stamford Symphony Outing, February Calendar, and More! Bingo is this Friday Night! There's still time to register for Bingo Night on Friday, February 8. Cost is $10 per person for 10 games of Bingo with cash prizes. 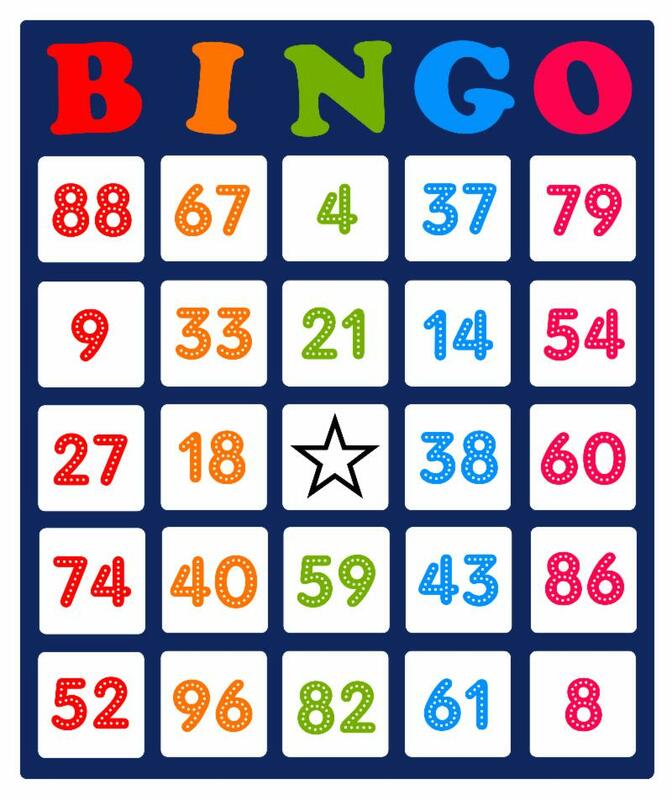 To register for Bingo, please fill out this form and return with payment to your child's classroom. Please pay with a check when possible. Proceeds from this Bingo Night will be used to support the 5th grade class field trip to see Wicked on Broadway in New York City. Volunteer opportunity: We are looking for volunteers to help on Bingo Night. We also need gift basket donations for the raffle. Please click here to sign up . If you plan to donate a themed raffle basket for 5th Grade Bingo Night, please deliver to Mr. Zaremski (room 180) by Wednesday, February 6th. We are also looking for baked goods contributions - if you would like to contribute please contact Mary Beth Woods or Darlene Seitz . Mrs. Anker and Miss Paolino want to remind everyone that the Kids Heart Challenge is this week! Students can click here to view Stillmeadow's page on the Kids Heart Challenge website and sign up to complete a challenge and raise money to support the American Heart Association. Thank you for helping a great cause! Stillmeadow is participating in the Stamford Symphony’s Advance the Arts program to introduce students to the symphony and raise money for school arts programs. Through this program, Stillmeadow families can purchase discounted tickets for an upcoming symphony performance, which includes a special pre-concert music education program designed for kids ages 12 and under. Ticket proceeds from this program benefit Stillmeadow. See below for event details. Order forms with payment are due by Friday, February 22. 2:00 pm – MusiKids: Interactive music education program for children to learn about the afternoon’s program and meet one of the symphony musicians. 3:00 pm – Symphony performance featuring the music of Schubert, Haydn and Mozart. 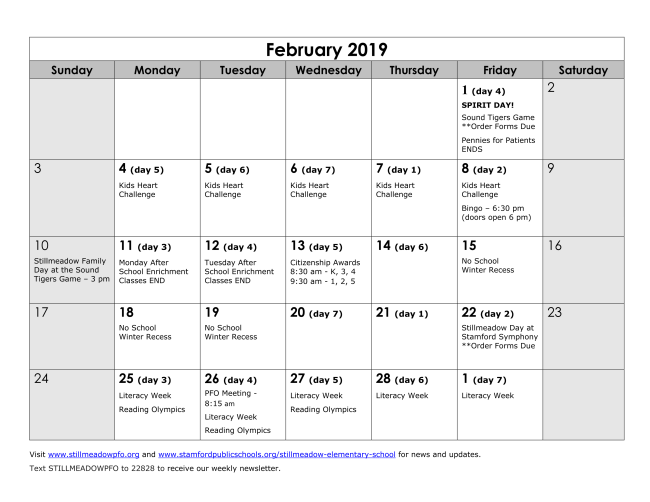 The February 2019 Stillmeadow Calendar - which includes the 7-day rotation and reminders about upcoming school events - will be coming home in student folders this week. You may also download and print a copy of the calendar by clicking here . The 2018-19 Stillmeadow Yearbook is on sale now. Yearbooks are $20 each and must be purchased in advance of publication. We will NOT sell copies of the yearbook in June. Order forms to purchase with cash or check were sent home last week in student folders. Click below to order with a credit card. Stillmeadow's Yearbook ID Code is 5259619. ﻿Questions? Contact Kristen Stops . Support Stillmeadow at Amazon & Grocery Stores ! Stillmeadow earns cash whenever you shop Amazon through the Amazon School Rewards Program. Click here to enroll. Stop&Shop Bonus Card number is required for enrollment. Designate Stillmeadow (ID #06847) as your school. Click here to enroll. ShopRite Price Plus Club Card is required to register. Designate Stillmeadow (zip code 06902) as your school. Parents who enrolled their cards previously do not need to re-register . Ask friends and family to enroll their cards to support our school!